South Indian Rava Kichadi with vegetables, I make this at least once in 2 weeks for dinner or sometimes even for lunch for a weekday lunch box. This is a dish that I fall back to when I am really tired of cooking and want to keep it simple. Of course there's a little bit of veggie chopping, but for me this is simple when compared to making rotis and sabzi. Even people who don't like the regular rava upma would like this Kichadi and as for me, I love the flavor from the ginger and garlic and ghee and it tastes great with some coconut chutney on the side..
Chop the vegetables, pound together the ginger and garlic coarsely and keep. Heat about 2 tablespoons of oil, add the cashews, chana dal, urad dal and mustard seeds, when the cashews turn golden and the seeds start sputtering, add the onion, green chillies, ginger-garlic and 10 curry leaves and saute for 2 to 3 minutes till the raw smell of the ginger and garlic goes away. Now add the capsicum, cabbage, carrot and green peas and mix for 2 minutes. Now add the tomatoes, turmeric powder and fennel seeds powder and mix for another 3 to 4 minutes. Then add about 3 and a 1/2 cup of water and salt, mix, cover and cook till the water starts boiling. In the meantime, dry roast the rava/semolina for 4 to 5 minutes, remove and keep. Once the water starts boiling, remove the lid, reduce the heat to medium-low and start adding the semolina with one hand and keep mixing with the other, so that there will not be any lumps. Once you have added all the sooji, mix, cover and cook on medium-low till the semolina is cooked and the mixture has no water visible on the top, but is still not dry. It should be like a pongal or pudding consistency. Add the ghee, add the remaining curry leaves and coriander, mix, cover and switch off and leave it for 5 to 7 minutes. Then serve hot with chutney or transfer to a hot pack. You can use a mixture of oil and ghee in the beginning itself or if you don't want, you can leave the ghee entirely, but ghee gives a wonderful flavor. Don't use the finest semolina for this, then it will come out like a paste. 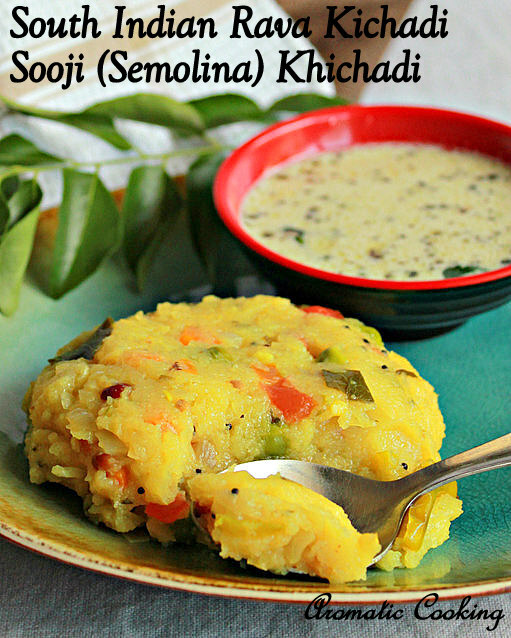 The Kichadi will thicken as it cools, so remove it when it's still like a thick pudding or pongal. If you are not sure of the salt, taste the boiling water, it should taste perfect. 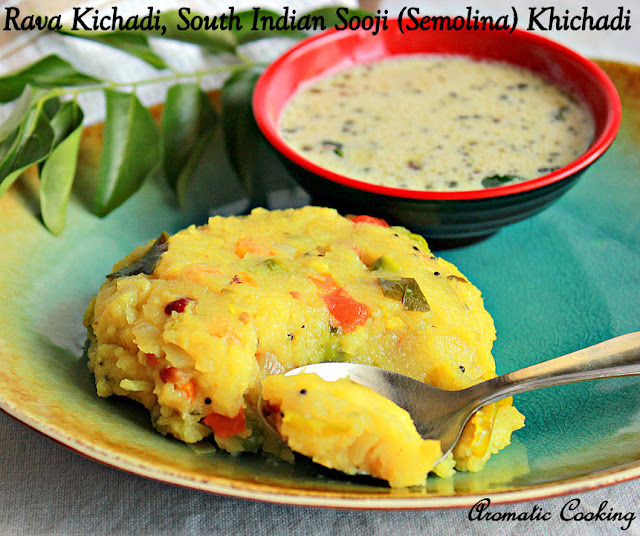 Love to eat rava kichadi with coconut chutney.. A wonderful combo!